Congrats on the award. You deserve it. Everyone says how much your agent spotlights help everyone. Even though I don't need to read more blogs, I'm adding the ones you awarded the winners. Congrats on the award and to it's recipients. Congrats on your award. Love the new look of the blog. 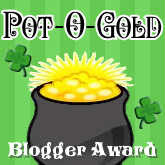 Congratulations on your pot o' gold! Congrats on the award! You SO deserve it! Your blog is pure awesomeness. Wow! Thanks for this award! I just saw this! I'm so glad you like my blog and enjoy it!I will be blogging about this shortly! Wow.